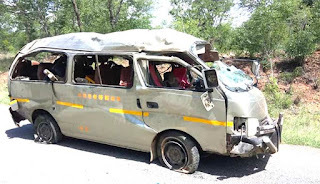 FOUR people died on the spot while 13 others were seriously injured and rushed to Kwekwe District Hospital when a commuter omnibus they were travelling in burst its right rear tyre resulting in the vehicle veering off the road and overturning. The kombi was heading to Kwekwe. Police in Kwekwe confirmed the accident which occurred around 9am near Tiger Reef Bridge just outside Kwekwe along the Kwekwe-Gokwe road. The kombi which had 17 occupants including the driver and conductor was heading to Kwekwe.